The Centre for Blood Research (CBR) participated in World Thrombosis Day – a global movement to raise awareness about thrombotic disorders: deep vein thrombosis, pulmonary embolism and venous thromboembolism – by hosting the first World Thrombosis Day event in Vancouver on October 13th 2016. World Thrombosis Day was founded in 2014 by the International Society of Thrombosis and Haemostasis (ISTH) in response to members’ requests for a focused global awareness day on thrombosis, and with the aim to combat thrombosis-related disorders. It is recognized globally on October 13, the birthday of Dr. Rudolf Virchow, a pioneer in the pathophysiology of thrombosis. The ISTH mission is to reduce the number of premature deaths from thrombosis by 25% by 2015. The ISTH mission is to reduce the number of premature deaths from thrombosis by 25% by 2025. The CBR was the first in Vancouver to host this public education event on thrombosis and stroke. 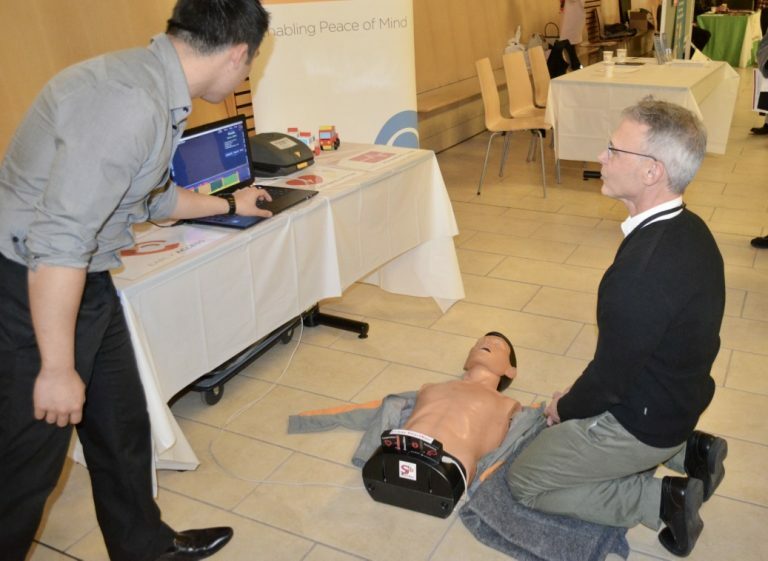 On the evening of October 13, CBR staff and volunteers welcomed members of the community, patients and various professionals at the Life Sciences Building on UBC Campus. Each attendee received a gift – a CBR tote bag and a 14 day Gold’s Gym pass – and then was free to enjoy tasty food, live music and to visit booths from 10 different organizations. Community centers, health consultants, support groups and pharmaceutical companies, all came together to support the World Thrombosis Day message and to connect with the public, by holding a booth at this CBR-hosted event. Iridia Medical held a “Chain of Survival” demonstration, offering attendees the opportunity to practice their CPR skills on a mannequin. Likewise, North Shore Stroke Recovery Centre got everyone’s brain working hard when it came to naming flowers based on the first letter of the alphabet. Love Your Age provided blood pressure checks and gave away free pedometers, and Dieticians engaged everyone in ranking the salt content of various common foods. The hands-on experiences at the booths, were not only entertaining, but also empowered participants to take control of their well-being by learning causes of disease, risk factors, signs/symptoms and methods of prevention. As a result of this event, we have built new partnerships and raised much needed funds to support CBR-sponsored educational programs! After enjoying the booths, everyone moved to the lecture hall for cheery and highly informative presentations by the guest speakers: Dr. Agnes Lee, Physician and Clinical Thrombosis Program Head at the Vancouver General Hospital, Dr. Ed Pryzdial, Scientist at the Canadian Blood Services and Associate Director of the CBR, and Dr. Wesley Pue, Professor of Law at UBC and a patient with a history of thrombosis. Dr. Lee discussed the issues surrounding the clinical aspects of thrombosis and the differences between myocardial infarction, pulmonary embolism, stroke and deep vein thrombosis. She emphasized how important it is that individuals become informed, and that they learn how to reduce their risk. Her vast experience was much appreciated by the audience, as was evident by the stream of questions following her presentation. Dr. Pryzdial energetically, and with an ever-present humor, took everyone on a PowerPoint tour of his research that culminated in a description of his lab’s recent discovery of a promising new therapy for thrombosis. His group recently patented Xai-K (pronounced “ten-eh K”), a drug that can selectively target the problematic clots, and can either enhance currently available therapeutics, or can function as a clot buster on its own. His presentation featured time lapse videos and was spiced with quizzes and prizes, which did not fail to inform, as well as to amuse. The talks culminated with Dr. Welsey Pue’s personal story on how blood clots affected him, starting from the day he was diagnosed to the problems he faced along the way. His talk was a great reminder of the importance of awareness and prevention, the value of family support, and, also, why scientists and physicians must communicate with patients and the public. This final talk also stimulated considerable discussion, as several attendees shared their own stories, and engaged in an open forum, with input from the experts, Drs. Lee and Pryzdial. As a result of this event, we have contributed to increasing awareness and understanding of thrombotic disease. Hopefully this will trigger a daily effort to prevent thrombosis, and to identify new solutions for this common, disabling and sometimes fatal disorder. Donations from attendees will go towards thrombosis-related education programs at the CBR. We also established new partnerships with a number of local organizations. We would like to thank everyone who contributed to the success of World Thrombosis Day: all CBR members who helped promote and organize the event; Brian Kladko for communication and media consulting; all the vendors and musicians; and Drs. Ed Conway, Agnes Lee, Ed Pryzdial, and Wesley Pue for their stimulating presentations. And of course, we particularly wish to thank all those who attended the event, and committed to increasing awareness of thrombosis. To view pictures of the event, visit our Facebook page.